Sell on websites, mobile phones, social sites and marketplaces like Google Shopping, Amazon and Shopping.com. Ecwid integrates with social networks including Facebook and Tumblr. Your Ecwid store looks perfect on any smartphone and adapts to your customer’s screen. If you’ve dedicated time to designing a creative and unique PageCloud website, now you can kick it up a notch by offering items for sale through it. Turn your existing website into a PageCloud e-commerce store in just a few simple steps with the easy-to-use Ecwid shopping cart. Ecwid provides advanced features and unmatched support to power your online business. Ecwid’s widget integrates seamlessly to create a PageCloud shopping cart, no hard coding or hassle necessary. It takes only minutes to start selling your products through your new PageCloud e-commerce site. Sign up for a free Ecwid account to launch your PageCloud store — you could be selling today. We keep it efficient: simply use the Ecwid control panel as your one stop for inventory management, transactions, shopping cart settings and more. Best of all, you keep creative control over your website and design. Whether you use a PageCloud theme or craft your own design, Ecwid will work for you. 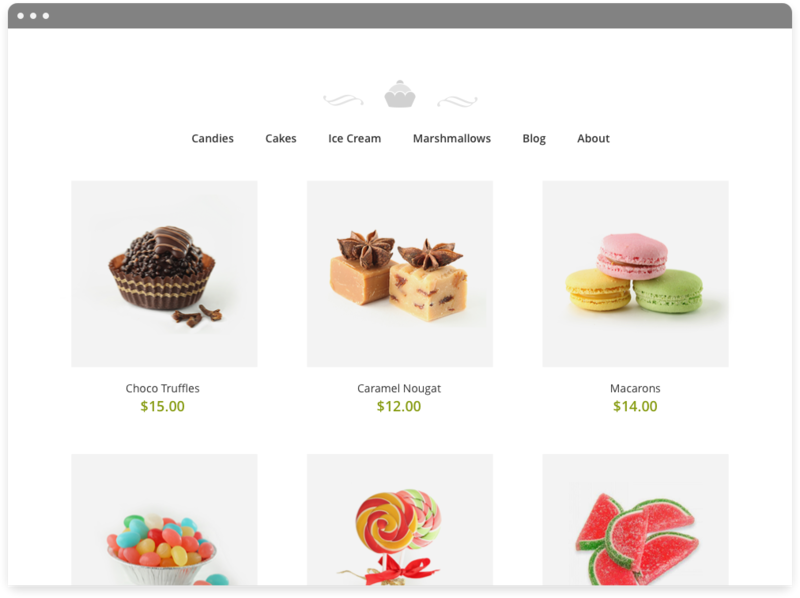 The simplicity of Ecwid’s e-commerce storefront means you can keep your customized PageCloud design — even on a phone or tablet. Unlike other e-commerce solutions, Ecwid’s shopping cart design is mobile-friendly by default and looks native to your site on any browser. Want to switch it up? Try different Ecwid templates or take advantage of CSS customization to make your PageCloud shopping cart look just right. Ecwid’s feature-rich and user-friendly shopping cart stands above other e-commerce widgets. Don’t be held back by janky integrations, cumbersome back-end settings or limited payment and inventory options. Ecwid provides full drag-and-drop support, lightning fast AJAX interface, beautiful image galleries and customizable design layout so creating your PageCloud shopping cart will be a breeze. Any changes you make update automatically to your PageCloud e-commerce shop in real-time. Plus, Ecwid is translated into 45 different languages so you can connect with customers around the world. To help keep your business running smoothly, Ecwid has powerful inventory and data management, flexible shipping and payment solutions, and advanced customer interaction options. We’re frequently adding features and making improvements to Ecwid, but don’t worry — updates happen seamlessly and automatically, so your PageCloud e-commerce store is always running. Your beautifully designed PageCloud shopping cart is just minutes away with Ecwid’s revolutionary free service. Upgrade to a premium account for additional features and advanced support — but you’ll never lose Ecwid’s free services. Enhance your online business and help it grow by simply adding e-commerce functionality to your existing PageCloud design. Manage your PageCloud e-commerce store with an intuitive, powerful control panel that’s customizable to fit your needs. Powered by Ecwid, you’ll take your business to the next level.